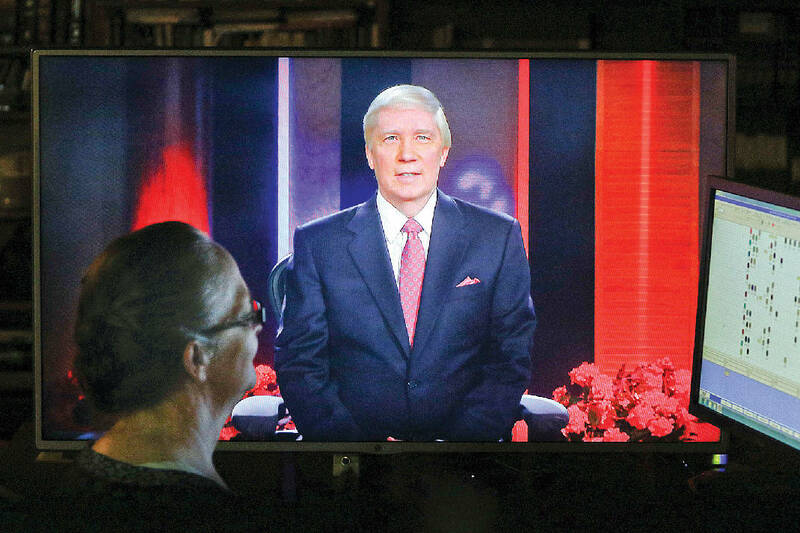 Esther Wilson, floor director for the John Ankerberg Show, left, watches a monitor displaying John Ankerberg as he sits in his Chattanooga studio on April 7, 2015, where he films a Christian evangelist TV show attempting to prove the existence of god. * On TV: WTVC-TV 9. 10:30 p.m. Sunday. John Ankerberg sits behind a big wooden desk in his upstairs office on Lee Highway in a building that could be home to independent insurance salesmen or accountants. You'd never know from the exterior of the building what's inside, and that is very much by design. An evangelical Christian known for "The John Ankerberg Show" TV broadcasts and his easily recognizable straw-colored hair, Ankerberg prefers that his headquarters, and the equipment inside, remain under the radar. Twenty-five people work inside the building and, in addition to offices, there are editing bays where videos are being translated into several languages and another where videos are being close-captioned. 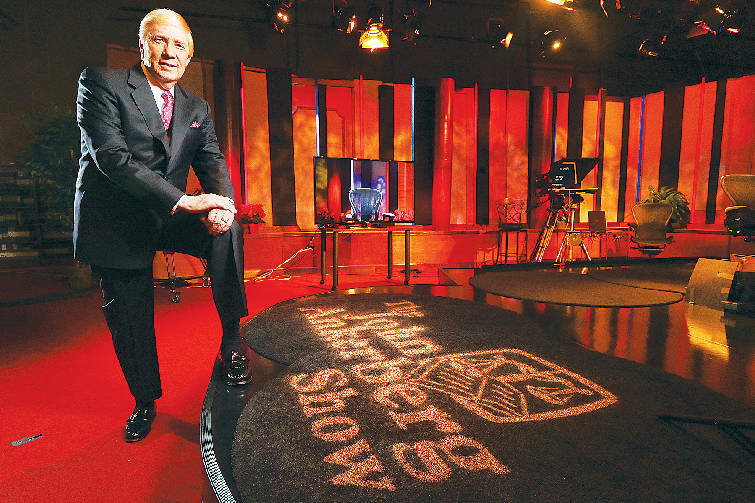 There is a DVD-dubbing suite and lots of space for storing copies of the hundreds of programs that Ankerberg has done over the last 35 years; shows that, in the last years, have been shot in his headquarters in a five-camera, all-digital studio that rivals any of the local TV network affiliates. And those shows -- which are available in 196 countries around the world -- are in addition to the 158 books and study guides he has written. They include titles such as "16 Prophecies That Prove Jesus Is the Messiah," "Israel Under Fire" and "The False Gospel of Oprah and Her Friends." His weekly television shows, which he hosts, are dedicated to "presenting and defending the Gospel" and feature guests who are sometimes on opposing sides of an issue. Recent episodes include "The Evidence for Jesus' Resurrection," "Islam's Infiltration of America" and "How Is Sharia Law Dangerous for Western Society?" For his work promoting Christian ideals, Ankerberg recently was awarded the William Ward Ayer Award, named for the founder of the National Religious Broadcasters, a nonpartisan, international association of Christian broadcasters. Although he supports many strong evangelical tenets, including a belief in the coming end of days and that New Age practices have occult underpinnings, he also has garnered wrath from some in the community for his statements that science can help explain the biblical story of Genesis and the creation of the universe. On air, he also tends to be more academic than fire-and-brimstone, more even-toned than strident. "His views are biblical. He speaks the truth found in the Gospel," says Mike Carter of Chattanooga. "He is a strong supporter of Israel from a biblical standpoint. The truth is hard to accept from a worldly perspective." "Used to watch occasionally when I lived there, but found him arrogant and not nearly as correct as he though he was; which was he was right and anyone disagreeing with him is bound for hell," says former Chattanooga resident Ray Roberts. John Ankerberg stands in his Chattanooga studio on April 7, 2015, where he films a Christian evangelist TV show attempting to prove the existence of god. On a day earlier this week, impeccably dressed in a blue pinstripe suit, plum-colored tie and black polished loafers, Ankerberg alternates between using his iPad to show off what The John Ankerberg Show app has to offer and reading from a trifold, full-color, 8 1/2-by-11-inch brochure that lists the countries where "The John Ankerberg Show" is available, the dozen or so national and international networks around the world that carry it and the many TV stations across the country that air the program, primarily on Sunday night. "Technology has opened the door to people I never dreamed we could reach," he says. Ankerberg, 69, reels off his show's numbers and countries and languages from memory, moving his finger around on his iPad like a teenager playing "Candy Crush." He denies being a tech geek but acknowledges that, while he's not first in line to buy a new iPhone when it is released, he doesn't wait long. "That's pretty much the case," he says. About six years ago, Ankerberg found himself making frequent trips to Israel, looking to bring his show and the Gospel to people in that part of the world. While doing so, he felt instructed by God to boldly ask network executives in and around Europe to let him buy airtime in the very popular -- and expensive -- 8 p.m. Sunday slot. "At first they laughed, but then all of a sudden we were getting mail and emails from people wanting us," he says. Ankerberg says getting his message out to so many people is "mission work 101" and not about making money. Quite the opposite, he says, since he's spending money to buy the airtime. "It takes a tremendous about of time and manpower to have the shows translated, and it takes a horrendous amount of money," he says. "The shows are going into these remote parts of the world and we are not going ask the poor people there to send us something they don't have." Most of the funding comes from American donors, he says. Ankerberg was born in Chicago and began "The John Ankerberg Show" in 1980, shortly after moving to Chattanooga. He says the city has been a perfect place to maintain his ministry. Almost all his shows are taped here and his guests, which include world-renowned scholars and experts on everything from culture to science to the Bible, are flown to Chattanooga for tapings. "Chattanooga is centrally located, and the weather is fairly mild year round," he explains. The city's gig techonology has made things easier, as well, he adds. "The people who fly here marvel at how easy it is to get in and out of our airport," adds Alan Weathers, Ankerberg's executive assistant. The technology boom of the past few decades also influenced one of Ankerberg's latest quests. A few years ago, he was struck by the idea that nearly every human being on earth has a cellphone or will in the next few years. "There are already more cellphones in the world than there are people," he says. So he began working with an organization called Faith Comes By Hearing, which is dedicated to translating the Bible into all the languages around the globe. To date it has 875 recordings of languages spoken by 5.7 billion people -- Frafra, Guji, Kambaata, for example -- and hopes to add the 5,000 or so remaining languages in the next 15 to 20 years. The John Ankerberg Show app and jashow.org users can find a link to those translations, and Ankerberg and his staff are working on ways to make the app itself available in key languages from around the world so users don't first come to an English-only page. On the "Bible in Your Language" section of the app or homepage, you can select your preferred language, Bible version (King James, 2001 English Standard, etc. ), book and chapter and hear the verse read to you by actors who, in most cases, were raised in the country they're trying to reach, so they speak the native language. Ankerberg says his goal is to help Faith Comes By Hearing get the Bible into the hands, via cellphone, of people around the world, Ankerberg says. "I never even dreamt of this six years ago, but it has all opened up, and God has made it happen."